Where is the best public restroom in town? 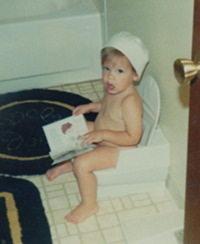 As soon as my children were potty trained, they developed an interest in public restrooms. While they were in diapers, my errands were managed with a minimum of distractions. Even taking into account car seats and wandering toddlers, routine stops could be made efficiently and quickly. Once they were in underwear, I had to schedule time for restroom visits at every stop. On our route, one or the other would announce the need. Off we would go to the inner sanctum, squeeze into what could pass for a closet, wash hands, and head to the next stop… and the next restroom. While many public restrooms were disgusting, we found some pretty interesting spots. The Best Public Restroom in Astoria is the in the basement of the old Post Office. No sooner than I would say “Post Office,” my kids were doing “the dance”. We would enter the front door, fly down the hall, throw open the door, and race down the double wide marble staircase. Once inside, they would scream and yell, making the tiled walls and floor reverberate with their echoes. I worried about being banned from the Post Office, but I do recall singing a song or two myself in that elegant old restroom. My children continued their interest in visiting restrooms when we moved, but I take the credit for finding the Best Public Restroom in Corvallis. It turns out to be in the basement of Benton County Courthouse. The walls are the insides of the stone foundation. The ceiling is low, so the door is low, making the whole effect one of entering a hobbit hole. In the stalls, you will be surprised to find the toilet tanks are made out of polished wood with beautiful porcelain handles for flushing. I recommend it as a fun excursion. You do have go through security to get into the building. Just say you are visiting Elections, which is across the hall from the women’s restroom. Usually, I only visit the courthouse restroom when I have, …um, business to take care of…. you know, courthouse business. But I have to confess to, once or twice, crossing the street and climbing the courthouse steps, just for old times sake and to make sure they have not remodeled what I think of as the Best Public Restroom in town.